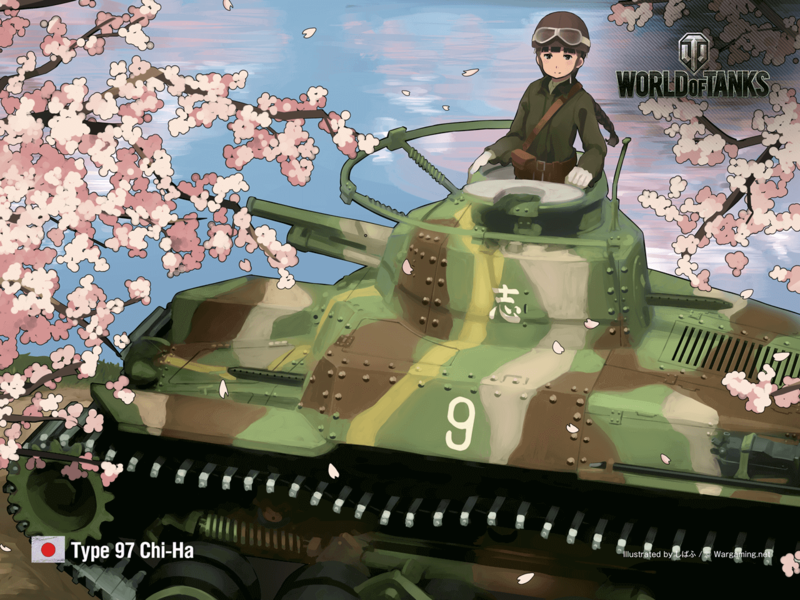 The ninth illustration is of a vehicle beloved by Japanese tank fans, the Type 97 Chi-Ha medium tank featuring the original turret. 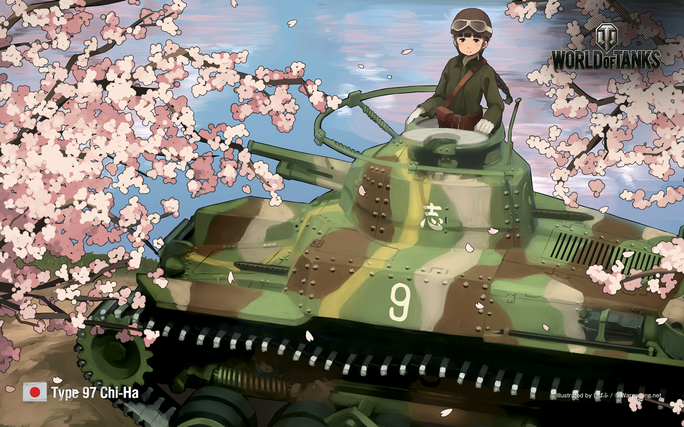 We have prepared a wallpaper version, so feel free to decorate your desktop with the scenery of the tank and the cherry blossoms! The first tank to be mass-produced and adopted for use by the Imperial Japanese Army was the Type 89 medium tank. This tank was light, well-armed and well-armoured for the battlefield it was intended to fight. It performed quite well. However, by the mid-1930s, technical issues and flaws become clearer. 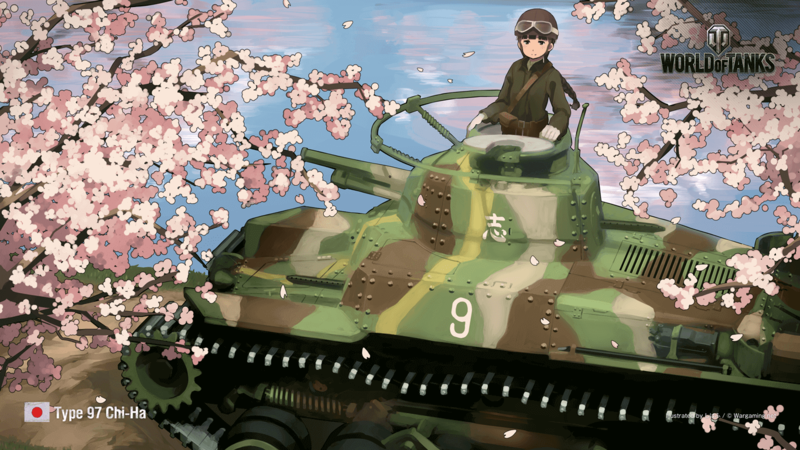 The Japanese Army had grown in tank proficiency, and after the success of the first tank, challenged themselves to create better vehicles. The Type 97 medium tank was thus developed to meet the demands and needs of the frontline crew, who were actually using the tank. At the time of its development, the Type 97 medium tank was a very well-built tank. The army did not have a clear idea of what the successor of the Type 89 medium tank should be like. Thus, two tanks, the lightweight and low-cost experimental tank Chi-Ni, and the performance-focused Chi-Ha, were tested. Some in the army feared a clash with the Soviets, where the Japanese tanks would surely have a difficult time against the Soviet tanks. However, Japanese tanks were designed for infantry support and for assault fortifications in China, so more emphasis was placed on the power of high explosive shells. This conservative choice was made due to a limited budget and a lack of resources, as the Chi-Ha was already over-engineered by the standards of the Japanese Army at the time. Building a tank required a host of the latest technology. Good armour required an understanding of metallurgy, while engine technology required an understanding of motorization. The development of a compact and powerful gun didn’t come easily either. Technological transfer from the private sector was vital for tank production, and showed the industrial might of a nation. In that respect, the Chi-Ha was a great achievement for the Japanese weapons industry. The fact that Japan was able to indigenously build the Chi-Ha showed how far Japan had come. Yet at the same time, the fact that Japan could not develop a more advanced tank by World War II showed the limitations of Japan's industry during that time period as well. What fate awaits the Chi-Ha as it bids farewell to the cherry blossoms in full bloom? Check out the vehicle in the Tankopedia! For personal use only. Unauthorized redistribution or use of the wallpaper is forbidden.